We traveled to various venues in our city to test the new iPad's 4G LTE and 3G CDMA EV-DO Rev. A data transfer speeds. We sold our iPad 2 (to finance the new iPad) so we tested AT&T's "3G+" UMTS/HSPA/HSPA+ using the iPhone 4S. We measured cellular data speeds with SpeedTest.net Mobile Speed Test app by Ookla. 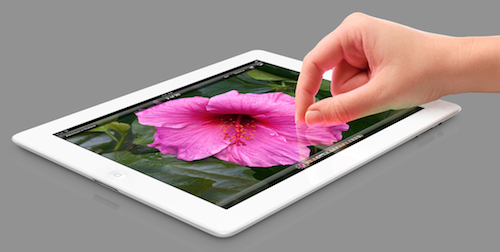 If Verizon 4G LTE is available in your location, your iPad 4G LTE will enjoy excellent download and upload speeds. Caution, though. You can use up your quota in a hurry. We used half of our 2G monthly allowance in just 3 days of SpeedTest runs. Though AT&T likes to call UMTS/HSPA/HSPA+ "4G," it's best described as 3G+ in our city. More to the point, it's not in the same league as Verizon's 4G LTE. However, on average, it's almost twice as fast as Verizon's 3G EV-DO Rev. A for both downloads and uploads. Some argue that if they don't have a 4G LTE signal in the venues they frequent, then they would rather have AT&T's HSPA than Verizon's EV-DO. However, as you can see from our seven test locations, there was one location where Verizon's 3G downloaded ten times faster than AT&T's 3G+. It all depends on where you are. We tried the Hotspot feature on the iPad. It worked fine except when we ran SpeedTest on two devices simultaneously, they split the bandwidth. That implies that if you have five devices connected to you iPad hotspot, each device will download only one-fifth as fast as a single device. In fairness, SpeedTest is a stress test. Yet if you are streaming video on multiple devices, you will have the same issue. We have debated about the practicality of using the iPad as a portable hotspot. For the past year we've used a Verizon Jetpack 4G LTE Mobile Hotspot (SCH-LC11). It supports up to 5 devices (same as the iPad). If you are using the new iPad as a portable hotspot, you will have to carry it with you at all times to support other devices such as your MacBook Pro or MacBook Air or a WiFi only iPad -- or all three. With the Verizon Jetpack "hockey puck," it's smaller (2 x 3.5 x .5 inches) and lighter (2.7 oz). You can carry it in your pocket. Then again, its battery doesn't last as long as the iPad's (3.5 hrs vs 10 hrs) and it requires a 2 year contract unless you pay full retail price of $269.99.